India is a country with full of unsolved mysteries, hidden places, unbelievable rituals and surprising culture n traditions. Today we are going to discover one of the most mysterious temple of South India which is also known as the World’s Richest or Wealthier Temple. Sree Padmanabhaswamy Temple located in Thiruvananthapuram, Kerala is a Hindu shrine dedicated to Lord Vishnu – The protector of Earth. This is very old temple which is very important in Vaishnavism and amongst the 108 principal Divya Desams (Holy Abodes). The temple is renown from the early medieval Tamil literature (6th-9th centuries), with structural additions to it made throughout 16th century, when its ornate Gopuram was constructed. The recent discovery of hidden treasure from the temple is surprised everyone, which itself cost Rs. 1.2 lakh crore or Rs. 1.2 trillion (US $19 billion) when the 5 vaults (Kallaras) of temple opened in year 2011 on Indian Supreme Court order. The treasure was full of Gold includes N-number of Gold coins, Gold Pots, 18-foot long pure gold chain, a gold sheaf weighing 500 kgs, 1200 Sarappalli gold-coin chains that are encrusted with precious stones, A pure Golden Throne studded with 100’s of Diamonds and other precious stones, meant for the 18-foot long Deity. Also several sacks filled with golden artifacts, necklaces, precious stones like – Diamond, Rubies, Emerald, Sapphire, Gemstones and Pearls. The several gold coins found here was from entire world dated 200 B.C was from The Roman Empire, The Napoleonic, Mughals and Dutch kingdoms, each antique coin costs in Cr. now-a-days. There are total 6 vaults in Sree Padmanabhaswamy temple out of that only 5 vaults open on order of Supreme Court of India infront of a 7 member committee formed by court. The archaeological departments categories vaults as A to F. A, C, D, E & F are already opened in 2011 while Vault B unopened over centuries which also considered as the largest amongst all. Some Historians estimate that the treasure in Vault B alone, would be worth at least Rs. 50 trillion (US$780 billion) in present day terms, without the cultural value being factored in. There is a strong story behind why till date no body dare to open the Vault B, as per locals & some priests the Vault B is protected by two enormous Cobras from several years and anyone who tries to open Vault B may face serious implications or Death. The symbols of same are shown on the Vault-B gate where two Big Cobra’s structure are guardian the doors. Also if any attempts are made by current technology to open mysterious Vault-B then Catastrophes are likely to occur in and around the temple premises or through-out India. This vault can only be open by a highly sacred Sadhu or mantrika who are familiar with the knowledge of extricating ‘Naga Bandham’ or ‘Naga Pasam’ by chanting “Garuda Mantra” so expect in this way, the doors of Vault-B can’t be opened by any means. The gate of Vault-B is made of Steel and has no bolts, latches or any other means of entry or opening. Even the Royal family of Travancore opposes the same. Earlier The Royal family of Travancore were the head of trust who manages the Shree Padmanabhaswamy Shrine but now the Supreme Court removed the Royal family from leading the Management of the temple. The Padmanabhasway Temple is a replica famous Shri Adikesavaperumal Temple at Thiruvattar. The Thiruvananthapuram city got his name from Anantha. 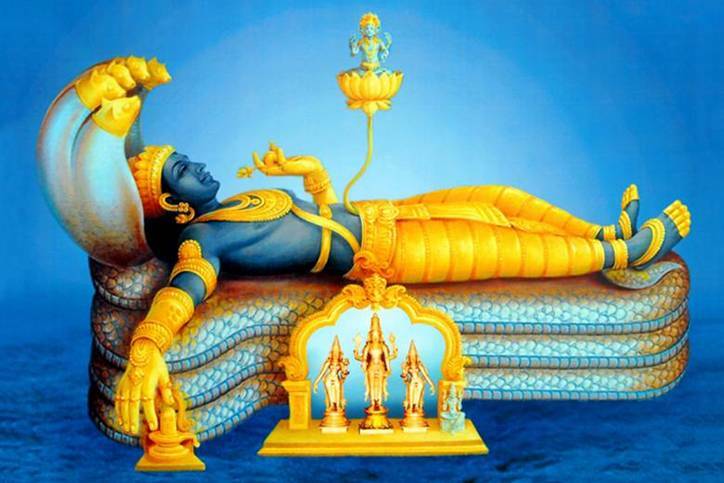 In the temple, Shri Padmanabha reclines on the serpent “Anantha or Adi-Sesha. 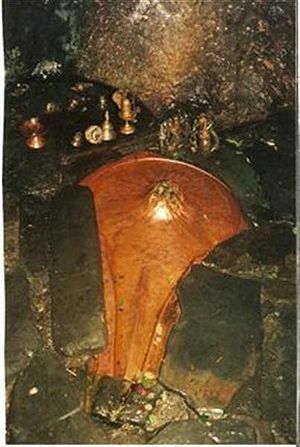 The Lord Vishnu right hand is placed over Shiva lingam. Sridevi, The Goddess of Prosperity and Bhudevi, The Goddess of Earth are by his side. Lord Bramha emerges on a lotus, which emanates from the navel of the lord. The Deity is made from 12000 saligramams. The entry into the temple is restricted to Hindu’s only and they have to strictly follow the Hindu Dress Code. The temple derives his name from the position of Lord Brahma seated on a lotus emanating from the lord’s navel. Among the Six vaults, Vault-B is closely associated with the Shri Padmanabhaswamy and it is not a part of Temple Treasury. Inside the temple, there are two other important shrines, Thekkedom and Thiruvambadi, for the Deities, Ugra Narasimha and Krishna Swami respectively. The Sree Padmanabhaswamy temple is veritably the heart of Thiruvananthapuram. It can be reached from any local carrier like Auto or Bus. Thiruvananthapuram is connected to Rail & Airways Networks. - Non Hindus are not allowed in the temple. - Pants and salwars/churidars are not allowed in the temple. A mundu (Kind of Dhoti or Lungi) can be rented from the temple premises for a nominal amount and ladies can wear it over their salwars while men can give their pants for safekeeping. - Around 7-8 a.m., (exact times can be obtained at the temple), some time is reserved for the royal family of Travancore to visit the temple, during which time others are not allowed into the inner sanctorum. 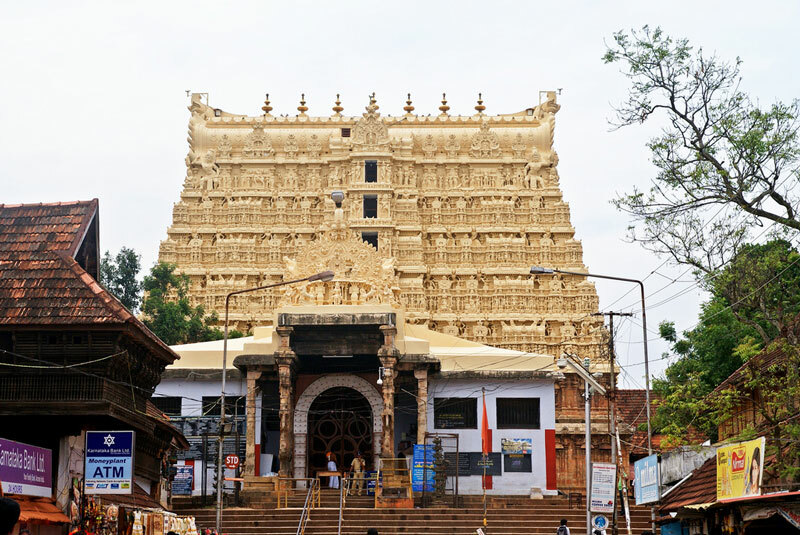 So when you visit next to Thiruvananthapuram, plan a visit to Sree Padmanabhaswamy temple to feel the beauty of temple and offer your prayer to Lord Padmanabhaswamy. Also check if you can get to hear more mysterious stories about World’s biggest Treasure. Do you know that there is a Turquoise (Transparent) water Kund (tank or water reservoir) in India since Mahabharata times? Yes, there is a place in heart of Incredible India - Madhya Pradesh known as BheemKund (Bhimkund) located near Bajna village in Chattarpur district in Madhya Pradesh. This is 77 kms. away from the Chattarpur district by road in Bundelkhand region. Bheemkund also known as Neelkund is a natural water source and a holy place in India during Mahabharata kaal (times). The water of kund is so clean, transparent that you can clearly see fishes playing in the water. According to stories this kund is associated with Mahabharata time, when Pandavas were in their exile (Vanvas) they visited this place at that time Draupadi (wife of Pandavas) felt thirsty and asked for water, Pandavas started searching for water reservoir but unfortunately they haven’t found any source, that time Bheem - the strongest man on earth (according to holy Mahabharata) smashed the earth with full strength from his mace (Gada – made of metal with spherical head mounted on a shaft, with a spike on the top) and water comes out of the place. That’s why this Kund is known as Bheemkund (Bhimkund). There is saying that depth of Bheemkund is limitless/endless and till date no one is able to find the actual depth of Bheemkund. Few years ago a team from Discovery channel visited Bheemkund and tried to calculate depth of kund but unable to do so. Locals here believe that Bheemkund is also an indicator of upcoming natural calamities. At the time of Tsunami in 2004 the water level here rose by 15 feet and same is the case at the time of Nepal or other earthquakes. People also believe that water of this kund (tank) is so pure (holy) that anyone who bath here on the day of Makar sankranti will be free from all sins. 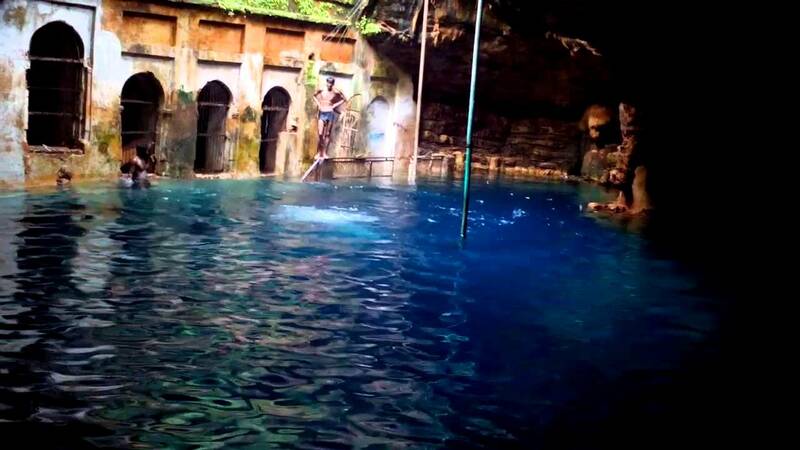 The water of Bheemkund is turquoise blue; clean, transparent despite several people comes here daily for a holy bath. By Rail – There is no railway station near Bajna village in less than 10 kms. However Bina Junction is the major railway station at a distance of 137 kms connected to all major zones. 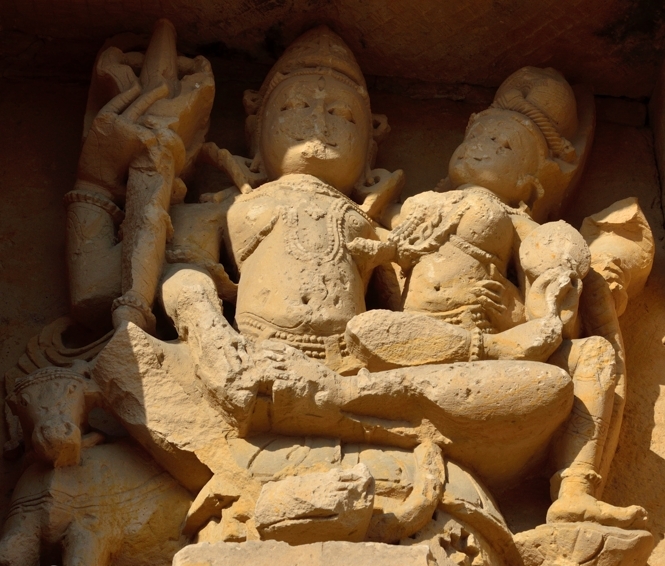 By Air – Khajuraho Airport is the nearest to Bheemkund at a distance of 92 kms. By Road – Take a taxi from Khajuraho or Chattarpur town to reach Bheemkund, The distance from Khajuraho to Bheemkund via road is 92 kms. and from Chattarpur town is 77 kms. Taxis are easily available from these places. Patal Bhuvaneshwar, one of the most fascinating places of the Kumaon region of Uttarakhand, is a limestone cave temple 14 km from Gangolihat in the Pithoragarh district of Uttarakhand state in India. It is located in the village Bhubneshwar. 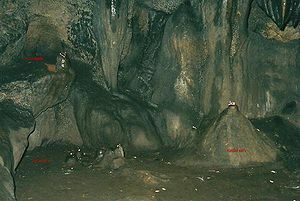 Legend and folklore have it that this underground cave enshrines Lord Shiva, Lord Vishnu, Lord Bramha, Ganesha and thirty three crore (33-koti) Gods & Goddesses of Hindu religion. The cave is 160 m long and 90 feet deep from the point of entrance. 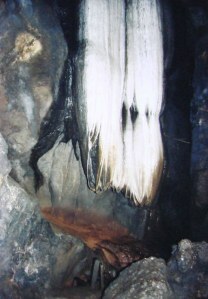 Limestone rock formations have created various spectacular stalactite and stalagmite figures of various hues and forms. This cave has a narrow tunnel-like opening which leads to a number of caves. The cave is fully electrically illuminated. It is built due to the flow of water. 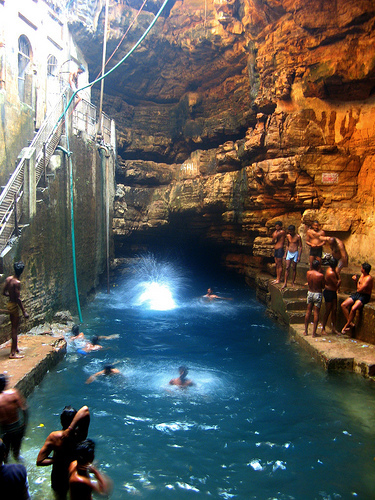 Patal Bhuvaneshwar is not just one cave, rather a cave city. Caves within caves, steps leading to another, each one unmasking deep secrets from within. It has some cave opening and it is believed that these opening will be close as the centuries pass on. The scientific fact is that it's still being developed due to crystallization of the minerals which are dissolved in the water. As per belief, some doors which are now closed were opened thousands of years back. The total distance that a visitor can travel 70 ft below the surface is about 400 ft, with constant fear of falling down on the slippery passage. Humidity is very high and oxygen low. It is believed that only a small part of this cave system has been explored and major portion remains hidden in darkness and mystery (It's yet to be fully explored). Throughout the cave, the carvings are made on limestone rocks. As stated above, each god is seated in this cave. A general belief, that the worshiping in this cave is equal to the worship of Char Dham of the state. The great cave has four gates (Dwar) to access. The names of these gates (Dwar) are as Randwar, Paapdwar, Mokshadwar and Dharmdwar. It is said that the Paapdwar was closed after Rawana was no more and likewise Randwar was closed after the great war of Mahabharata. In this cave, the hairs of Lord Shiva, the Arawati of Lord Indra and the tongue of God Kali Bhairav, are kept. The first human to discover this cave was Raja Ritupurna who was a king in Surya Dynasty who was ruling Ayodhya during the Treta Yuga. The story starts with Ritupurna and King Nala. It is said that once, King Nala was defeated by his wife, Queen Damayanti. In order to escape his wife’s prison Nala requested Ritupurna to hide him. Ritupurna took him to the forests of the Himalayas and asked him to stay there. While going back home he was fascinated by a deer which ran into woods and went after it. He could not find it and took rest under a tree. He had a dream where the deer was asking Ritupurna not to chase him. His sleep broke and as he woke up and went to a cave where a guard was standing. After enquiring about the cave he was allowed to go inside. 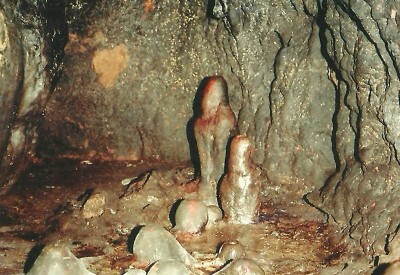 Right at the entrance, Ritupurna met Sheshnag who agreed to take him through the cave. It carried him on his hood. He saw the marvels of Gods taking place inside. Here were all the 33-crore gods and goddesses including Lord Shiva himself. It is said that after his visit, the cave was closed for ages with a slight prediction in the Skandpurana that it will be reopened again in Kaliyuga. 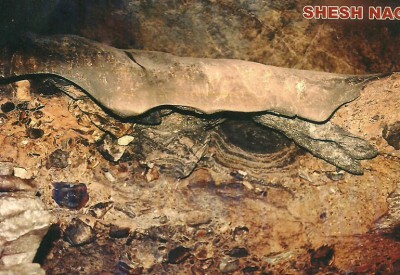 Shankarcharya in Kalyug, during his temporary visit to Himalayas re-discovered this cave. Since then regular worship and offering are being done at this place. According to belief King Rituparna of the Sun dynasty (Surya Vansha) discovered the cave in ‘Treta yug’. It has been described in the ‘MANAS KHAND’ of ‘SKAND PURAN’. Adi Shankaracharya visited this cave in 1191 AD. That was the beginning of the modern pilgrimage history, at Patal Bhuvaneshwar. The journey inside the cave has to be carried in feeble lights, holding protective iron chains. The Stone formations of Sheshnag can be seen, holding earth, heaven the world beneath. 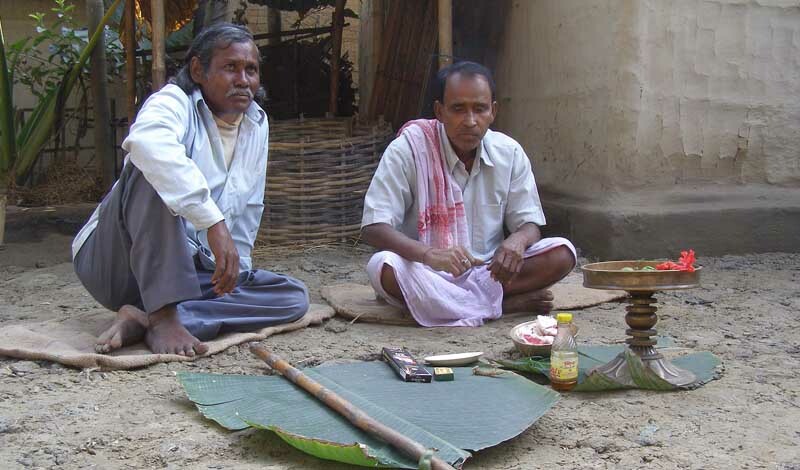 ‘Havan’ (fire sacrifice) is performed in a dimly lit, solemn atmosphere, under the spell of holy chants. You’ll also be impressed by theto visit these parts form the celestial heights of His abode in Kailash. 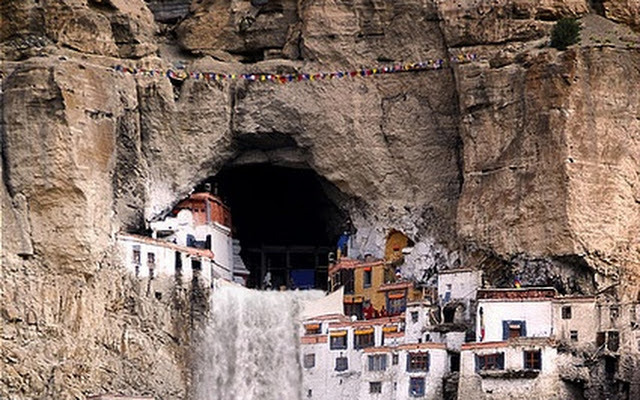 The cave, it is believed, is connected by an underground route to Mount Kailash. it’s believed that Pandavas, the ‘Mahabharat’ heroes proceeded towards their last journey in the Himalayas after meditating here, in front of Lord Shiva. The Bhandaris are the priest of this cave from very old time and more than 20 generation since the time of the Adi Shankaracharya. They are the resident of a nearby village called Bhuvneshwar. That is why this place called Patal Bhuvneshwar. 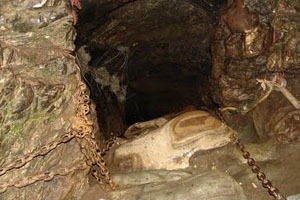 It is also believed that this cave is internally connected to the four abodes /seats (Char Dham). "This awesome cave is believed to be as old as the earth itself. It has been mentioned in detail in the 103rd chapter of Manaskhand of "Skanda Purana". 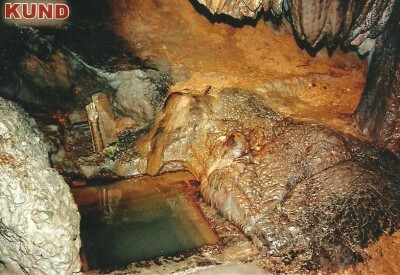 The first human who entered this cave was king "Rituparna" of Suraya Dynasty during the "Tretayuga". 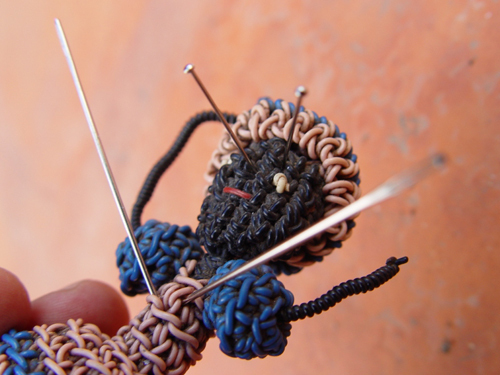 It is said that during his visit, he had encountered several demons and "Sheshnaag" himself acted as his guide. 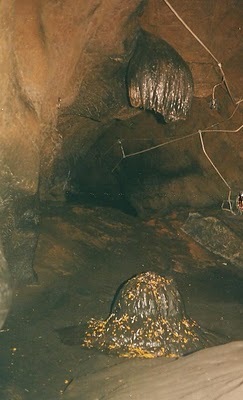 In "Duaparyuga" this cave was rediscovered by the Pandavas. In Kaliyuga, Adishankar Acharya consecrate this cave and since 1191 AD, this has been a place of visit, both for sightseeing and worship." 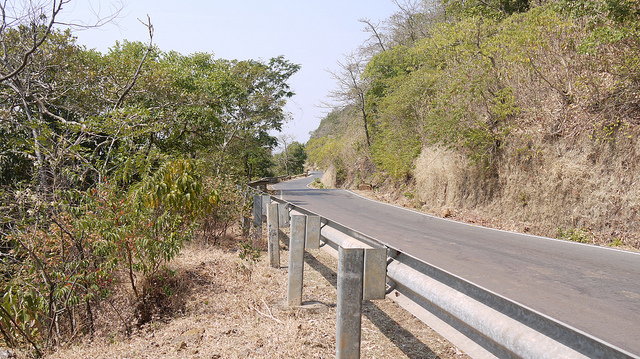 The motorable road ends half a kilometer away from the cave entrance. You have to descends nearly 100 steps into this narrow cave, to reach the sanctum sanctorum, which gives an overwhelming feeling that you’re entering the centre of the earth. Gangolihat is 14 kms away from Patal Bhuvaneshwar. Gnagolihat is rich in folk culture, music and religious traditions and had been chosen by Shankaracharya for the installation of Mahakali Shaktipiaeeth. Berinag & Chaukori is 27 and 38 kms away from Patal Bhuvaneshwar, these places offer the breathtaking views of the Himalayan peaks Nanda Devi and Pachchuli. Gwaladham A sleepy Himalayan town surrounded by apple orchards. The base for the trek to Roopkhand. The nearest airport to Patal Bhuvaneshwar is Pantnagar Airport. Pantnagar Airport is situated 244kms from Patal Bhuvaneshwar. Taxis are easily available to Patal Bhuvaneshwar from Pantnagar Airport. Patal Bhuvaneshwar is well connected by motorable roads with major towns of Kumaon. Tanakpur serves as the nearest railway station to this small town located at a distance if 154 kms. This station is well approached by many major cities of India such as Delhi, Lucknow, Kolkata and Agra. Buses and taxis are easily available outside the station for a ride to Patal Bhuvaneshwar. Patal Bhuvaneshwar is well connected by motorable roads with major destinations of Uttarakhand state. Buses from ISBT Anand Vihar are existing to Tanakpur, Champawat, Pithoragarh, Lohaghat and lots of other destinations from where you can easily hire a local cab or bus to reach Patal Bhuvaneshwar. 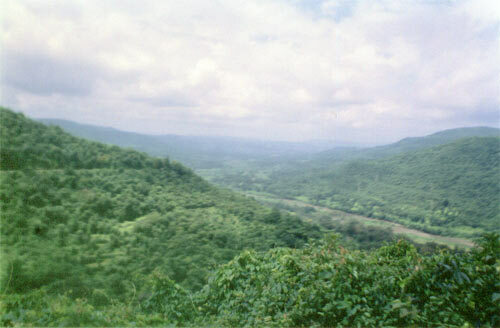 Amboli is in Sindhudurg, India. 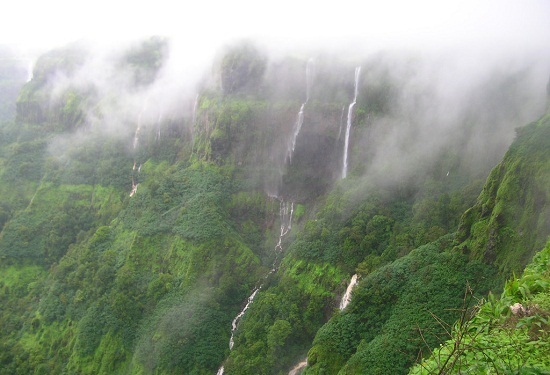 Amboli is a Ghat based hill station in south Maharashtra that lies in the Sahayadri Hills of Western India. At an altitude of 690 meters it is the last hill station before the coastal highlands of Goa and a relatively unexplored one. 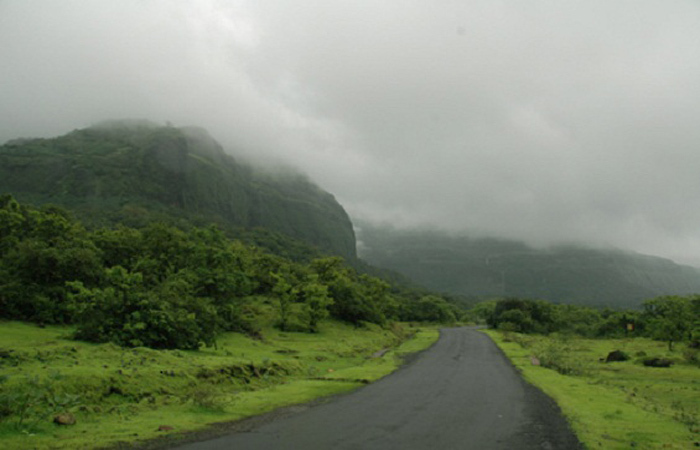 Amboli receives the highest rainfall in Maharashtra and remains pleasant all around the year. 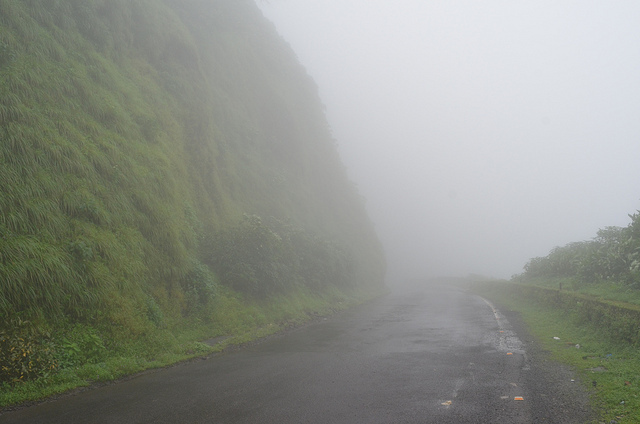 The best season to visit Amboli is during the monsoon between June and August where there are heavy rains. 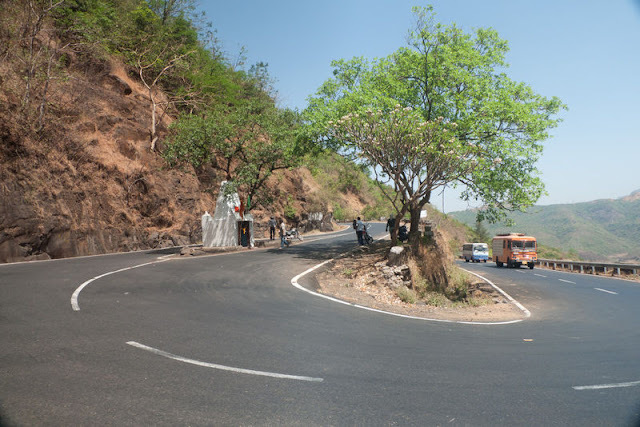 Bhor Ghat is a mountain passage located between Karjat and Khandala .The Bhor road ghat cuts the Sahyadri range to join Khandala to Khopoli and handles traffic on the busiest route in India between Mumbai to Pune. The Rail route which passes through the Ghat with 28 tunnels with old bridges makes the view of Ghat magnificent. The place is quite famous for the Camping. Chorla Ghat is a nature destination located on the intersection of the borders of Goa, Karnataka and Maharashtra. It lies to the north-east of Panaji, Goa (about 50 kilometers by road) and nearly 55 kilometers from Belgaum, Karnataka. 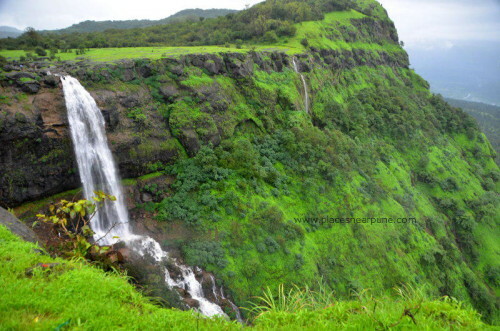 It is a part of the Western Ghats in the Sahyadri mountain range and is at an elevation of 800 meters. This region is mainly famous because it is the home of some of very rare species of wildlife, that’s the reason this place is particularly famous in between wildlife enthusiast. Kasara ghat is a ghat section in the Western Ghats near the town of Kasara in Maharashtra. 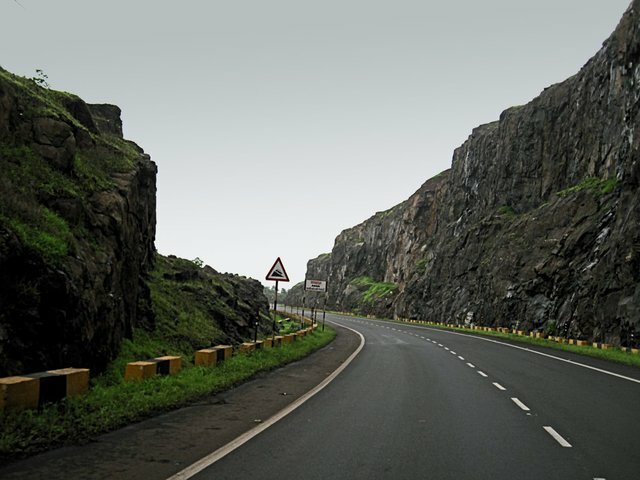 The Kasara Ghat is located on the busy Mumbai–Nashik route, Highway as suggested by many is haunted & in past many people have claimed to witnessed paranormal things over there but in reality that is because of the Accident prone nature of the roads pertaining to the bad condition of roads. 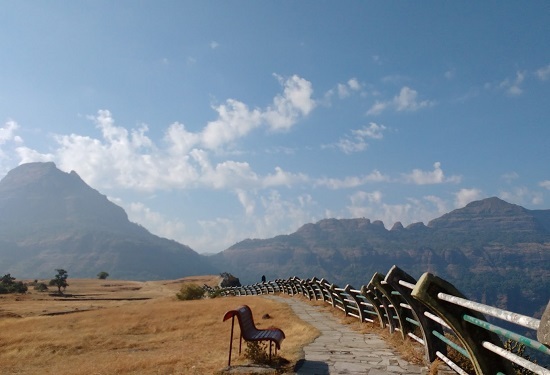 Covered by the dense and the beautiful Western Ghats, Malshej Ghat is a popular trekking destination, which is at its best during the summer and monsoon season. Plenty of hidden waterfalls and flamingos are the major Things to Do of the place. Located about 140 km from Pune, one can reach by road within 3 hours. Harischandraghad is a popular trekking destination near Malshej. Other places of interest are Jivdhan fort, Shivneri fort, Lenyadri caves and the Pimpalgaon – Joga dam. Tamhini Ghat is a mountain passage located between Mulshi and Tamhini in Maharashtra, India.-Situated on the crest of the Western Ghat mountain ranges, TamhiniGhat is noted for its surroundings comprising scenic waterfalls, lakes and dense woods. Though the roads through this ghat are not in the best shape but scenery around would make you forget the bumpiness of the ride. The ghat section stretches almost 15 km & trust us every inch you travel will be worth of the scenes you’ll capture. The high hills mountain pass is situated on the national highway 204 between Ratnagiri and Kolhapur. Amba Ghat nested in the Sahyadri mountain ranges and famous for its picturesque mountain landscapes,pleasant climate and a favorite weekend destination. Amba Ghat is also become one of the most famous venue for paragliding sport. 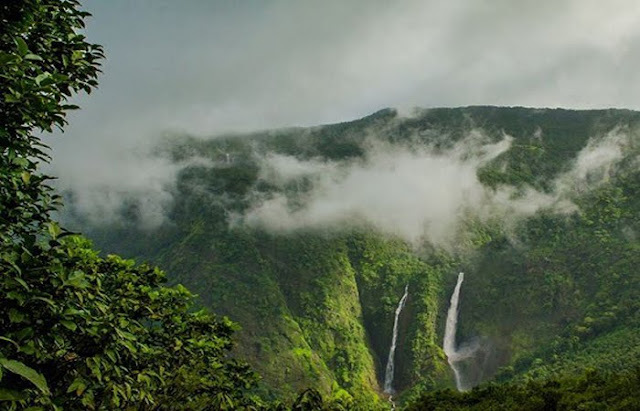 The Kumbharli Ghat is situated across the Western Ghats range and connects Konkan region of coastal Ratnagiri to Satara District. Kumbharli Ghatis one of the major mountain pass of Konkan region and always got a heavy traffic of transportation and vehicle. Famous Koyna Dam is situated at the eastern end of Kumbharli Ghat mountain pass. The stunning Kashedi Ghat with deadly curve is situated near Poladpur in the Raigad district on NH 17, the national highway on the banks of the river Savitri. 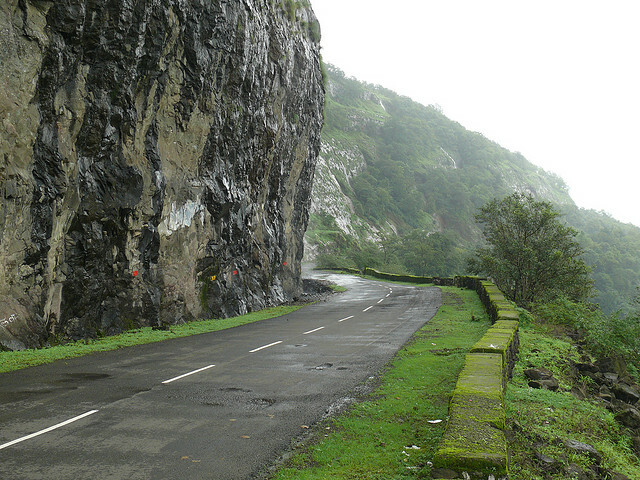 The deadly turns makes it one of the most dangerous mountain ghat of Maharashtra. Other mountain ghats are Nane Ghat, Shendurjana Ghat and Mahur Ghats. 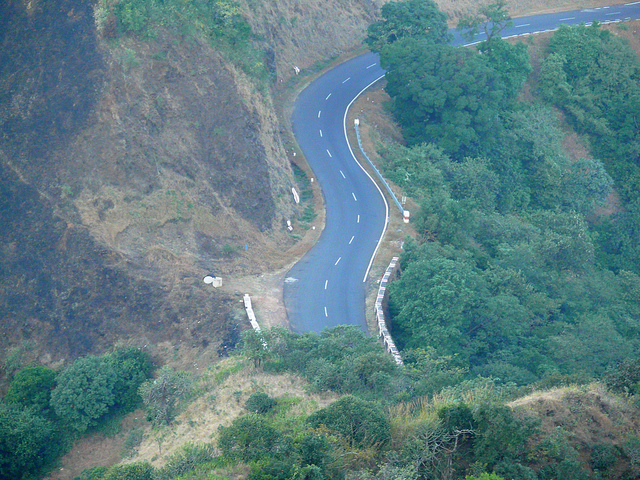 Western Ghats have so many other majestic mountain passes throughout its states such as wayanad Ghats. Khambatki Ghat gives best view of Khandala throughout the year, Ghat is situated on southern border of the city of Pune. The Nira River passes through the region and veer is the largest dam on the Nira River. 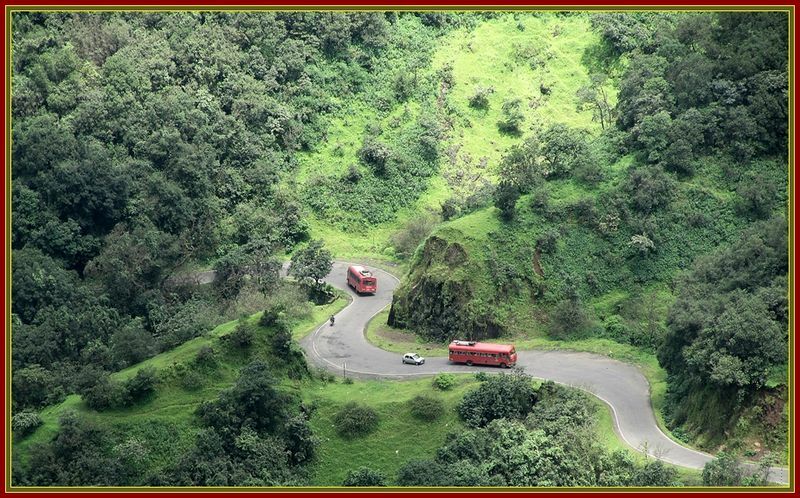 Madhe Ghat is located around 62 km south west of Pune bordering Raigad. 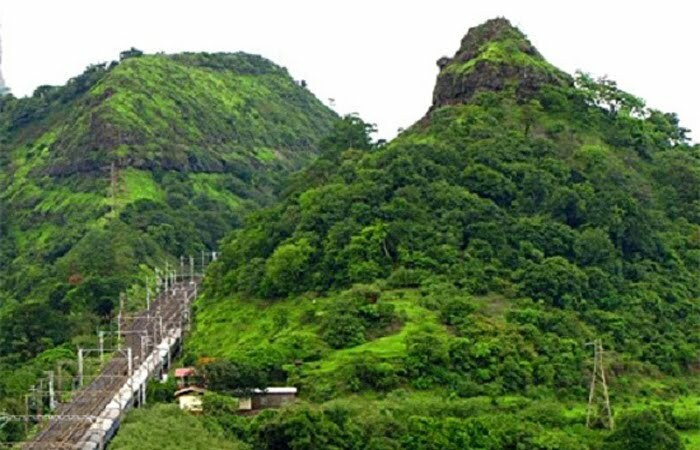 The Madhe Ghat is an ancient historical route,unknown place and a very beautiful drive via lovely surroundings, sunset, ghat and waterfalls. Varandha Ghat or mountain passage is situated on the crest of the Western Ghat mountain ranges and known for its surroundings, scenic waterfalls, lakes and dense woods. The Varandha ghat stretches almost 10 kilometres on route to Shivtharghal a famous tourist place. 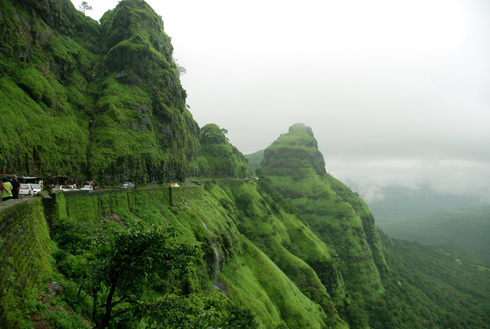 Shidi Ghat and Ganesh Ghat are two ghat on the route to Bhimashankar in the Ghat region of the Sahyadri hills. 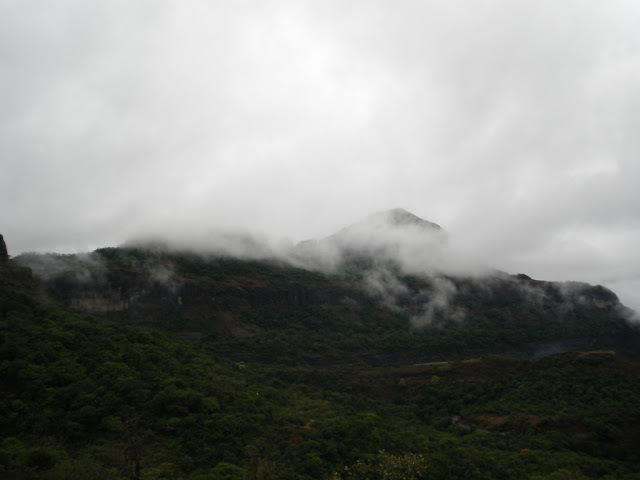 Bhimashankar is a wildlife sanctuary and part of Western Ghat,rich in floral and faunal diversity. 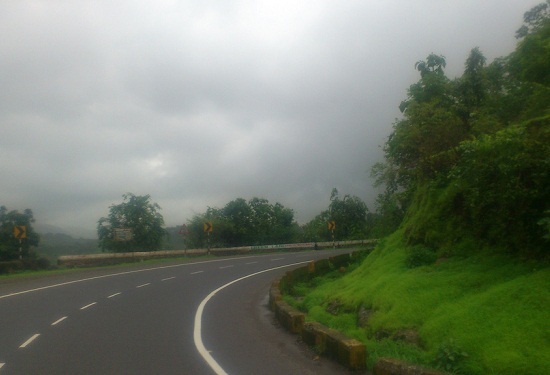 Gaganbawda is a town situated in the district of Kolhapur and gets the maximum rainfall during rainy season. The famous Karul Ghat and Bhuibawada Ghat starts immediately after Gaganbawada village are the most beautiful and very scenic in monsoon. 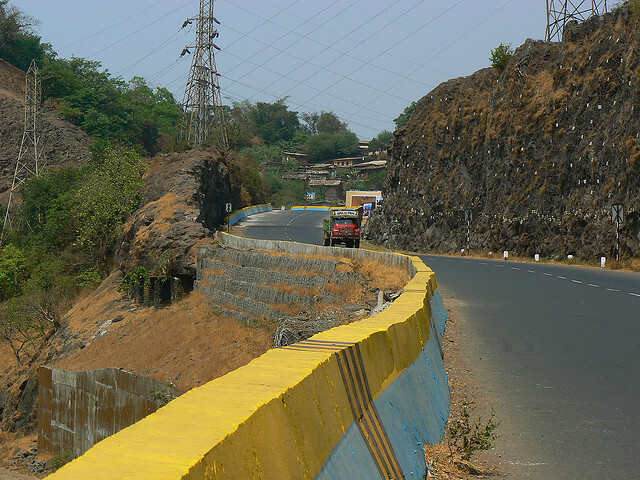 Ambenali Ghat mountain road across the Western Ghats range on the Deccan plateau links the cities of Poladpur and Mahabaleshwar. 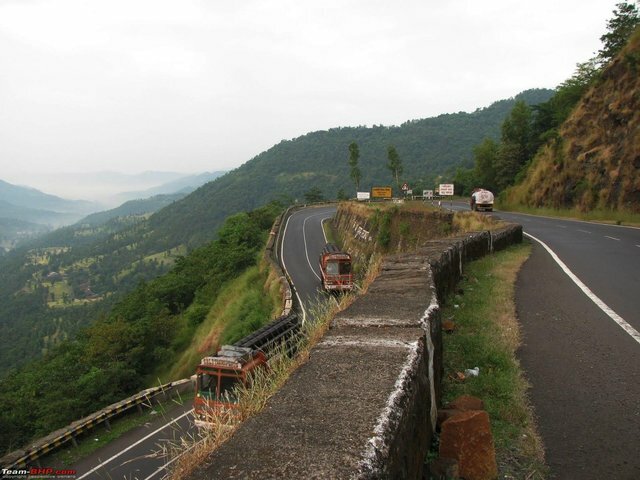 The ghat road or mountain road is a 40 km long mountain ghat road with many hairpin turns and slope. I am sure many of adventure travel enthusiasts would like to visit places that are hidden from rest of the world or that are inaccessible. There is an isolated location in Ladakh region of Jammu and Kashmir which is still not known by many of us. I am sure many of you who are reading this blog must have visited Ladakh once in your life but not aware of this place. The place is called as Phugtal Monastery or Phutkal Gonpa. Phugtal Monastery is a Buddhist Monastery located in the remote Lungnak Valley in south-eastern Zanskar, in the Himalaya region of Ladakh in Northern India who is the home for monks from several years and it is the only Monastery in the Ladakh that can be accessible through foot (Trek) as no road, transport is available to reach Phutkal. So if you are planning to visit Phugtal Monastery better do preparation first as it’s a day walk from Dorzang village, the end of the road leading from Padum. Phugtal Monastery is built around a natural cave, which is believed to have been visited by numerous sages, scholars, translators and monks around 2550 years ago. The monastery is a unique construction of mud and timber built at the entrance of the cave on the cliff face of a lateral gorge of a major tributary of the Lugnak (Lingti-Tsarap) River. From a distance, the monastery looks like a giant honeycomb. The remote location of the monastery is ideal for sages & monks looking for peace and solitude to Meditate. Among the earliest residents of Phuktal caves were the 16 Arhats or the legendary followers of Buddha, whose images appear on the caves walls. Phutkal Gompa was hidden treasure from many until Hungarian scholar and linguist Alexander Csoma de Koros visited the place and stayed between the periods of 1826-27 working on the first Tibetan-English dictionary. He studied at Phuktal Gompa with his Tibetan tutor. There is a stone tablet at Phugtal Monastery which serves as a reminder of his stay. The Phuktal Gompa owes its legacy to powerful and renowned scholars and teachers who resided in the cave, around which the monastery has been built, and has for long a place for retreat, meditation, learning and teaching. The name Phuktal (or Phukthal) reflects this, coming from the two words “Phuk” meaning “cave” and “tal” or “thal” meaning “at leisure”; second Phukthal – “Thar” meaning “liberation”. Hence the name Phuktal means ‘the caves of leisure’ or ‘the cave of liberation’. Recently a team of volunteer’s set-up solar micro-grid that produces Green Energy. So now electricity is available at Phugtal Monastery through Solar Panel. 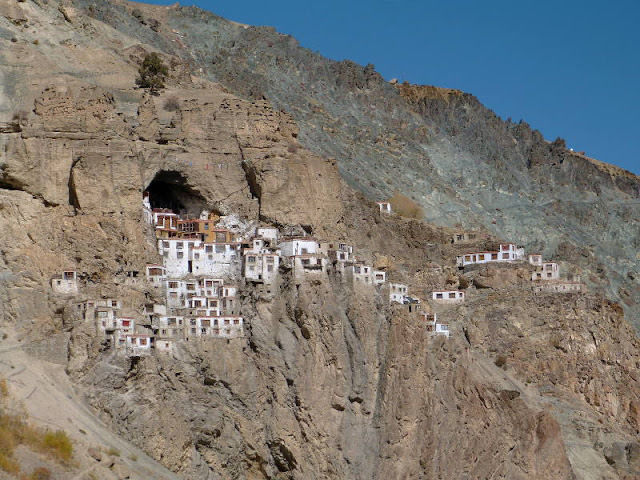 So now if you are planning your next trip to Ladakh do visit Phugtal(Phutkal) Monastery. 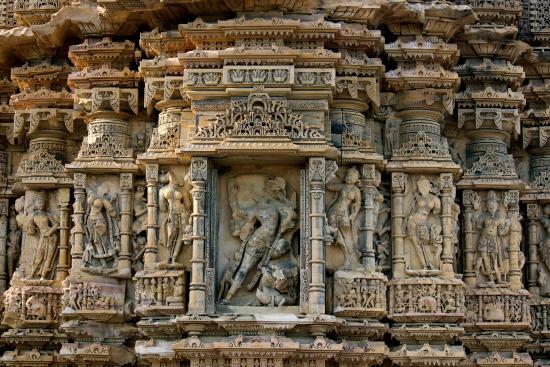 Do you know there is a temple in Barmer, Rajasthan where no one dares to stay overnight? 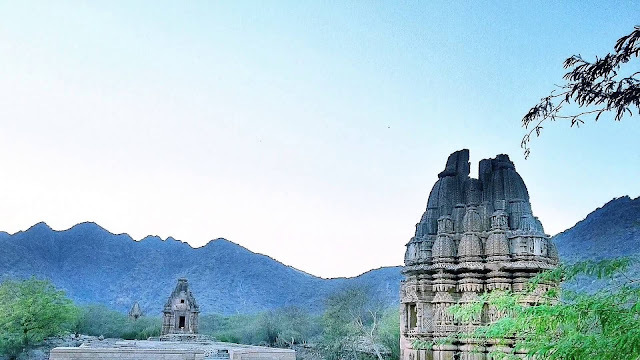 This place is known as cursed Kiradu Temples - this place is cursed and people here believes that if any human who dares to stay here overnight or visit after sunset turns into a stone. 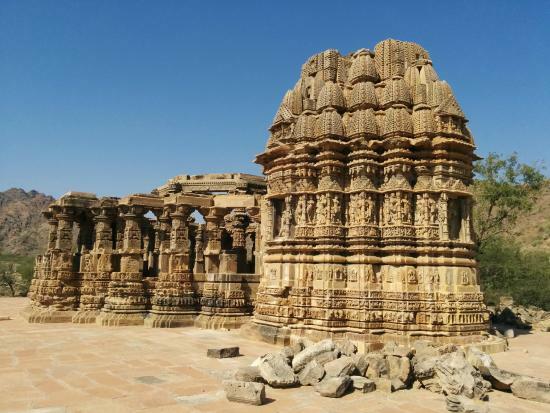 The Kiradu Temples of Rajasthan earlier known as “Kiradkot” are series of five beautiful temples in Thar Desert, located 40 kms away from Barmer district of Rajasthan in Hatma village. The city is known as city of temples or Unexplored Khajuraho of Rajasthan. Kiradu was a region ruled by Kirad clan of Rajputs, during 6th to 8th centuries. Back then and till a long time thereafter, it was called Kiradkot. Influence of Gujarati culture is quite evident, the reason of which is that Kirads were also the feudal subordinates of Chalukya, Gujarat. 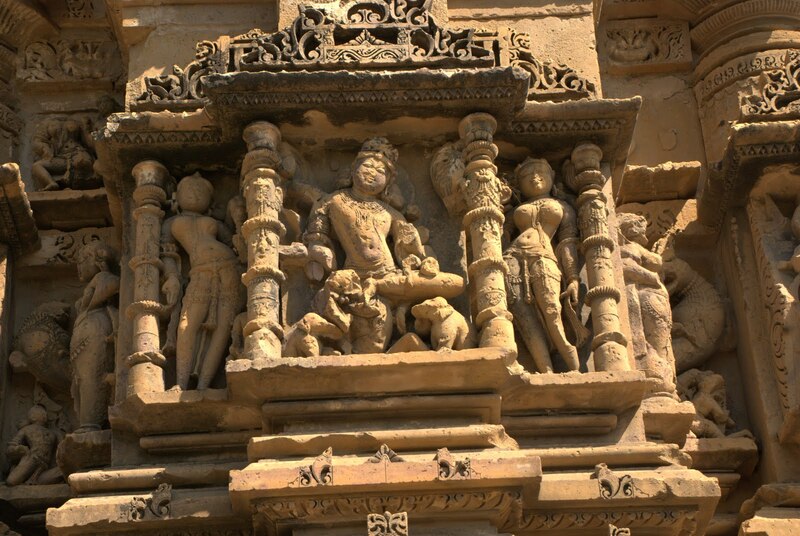 Some temples dedicated to Lord Shiva show evidences of Gupta period. 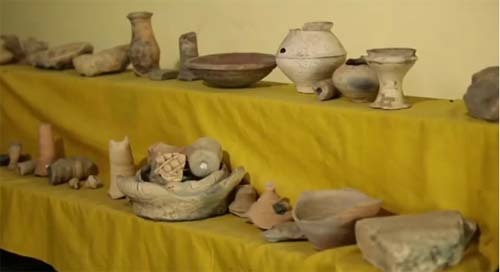 As per archaeological department, Kiradu was once a very prosperous city in 11th & 12th centuries. It was ruled by the King Someshwar of the Parmar Dynasty and that time it was capital of Parmar Dynasty. This place was destroyed by Turushkas invaders and was restored later on. However due to its location, it was never safe from the foreign invaders. Subsequently, this town situated at the foothills of beautiful mountains was deserted. The city is reduced to remnants of five temples dedicated to Lord Shiva & Vishnu, one is dedicated to Lord Vishnu & rest belongs to Lord Shiva, The Someshvara temple is considered a prime one. It is the largest of five and belongs of Lord Shiva. 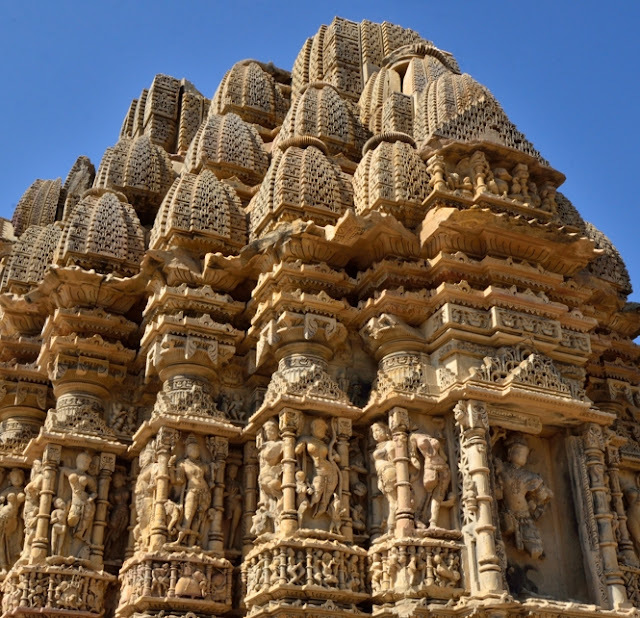 The temple structures are made of sandstone and hence they are still in considerably good shape. The architectural style of the temple belongs to Solanki style. Legend and some myths say that a saint who stays here with his disciple (student) cursed this place that entire kingdom to turns into stone. The story behind this curse is “one day saint decided to explore the region and went off without letting his students know. The students faithfully waited for their teacher, though, in the meanwhile were struck by some deadly disease. However, none of the villagers turned up for their recovery. It was only a potter’s wife who served them unconditionally and helped them regain health. Barmer Rajasthan news which has visited the site says that as the saint returned and found his students in terrible shape, he got so angry that he cursed the entire region to be destroyed and the people to turn to stone. The saint told the potter’s wife that the curse would not affect her, and told her to return back as soon as possible, taking care that should not turn back to see the place. However, as the emotional and terrified lady started her trip back to her home, she faltered and turned back to have one last look, which immediately turned her to stone. As per locals here, the stone statue of this lady is till date standing nearby. It is now said that anyone visiting the region after sunset would turn to stone. Also, since it was an easy location, it was later on overtaken by the Britishers as well. With continuous invasion, the resident of this heritage city soon deserted the beautiful city. The place is still unexplored and uncared for, you will hardly find any human or tourist here. The site is guarded by a forever-locked gate, the only entrance possible is a small rusty gate close to main entrance. No guard to open the gate, visitors will have to push open the smaller gate. Once you are in you’ll be welcomed by a hoard of goats freely grazing. There are a few mysteries surrounding Kiradu, which was first brought to public notice at a grand level by an MTV reality-adventure show, Roadies XI, post which the site has gradually recording some occasional tourists. Few days back a team of News Nation also visited this place with Indian Paranormal Society to find truth behind these stories, and they are surprised to record paranormal activities & amount of negative energies here. This also confirmed that the place is really not safe to visit after sunset.